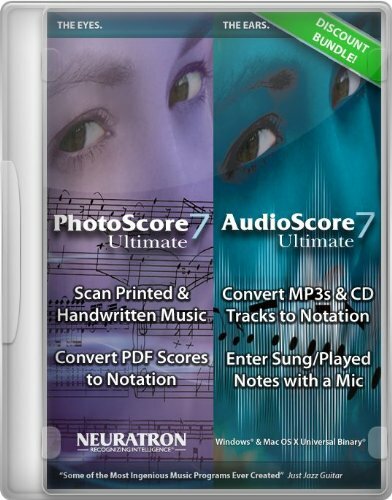 PhotoScore Ultimate 7 & AudioScore Ultimate 7 from Sibelius is a software bundle that includes a sophisticated scanning and printing solution paired with polyphonic music recognition and transcription software. PhotoScore Ultimate 7 provides the fastest way to scan music for transposition or arrangement duties. It can also scan music into other MIDI software such as sequencers or used stand-alone to scan in play back transpose and print scores and even save audio files. AudioScore Ultimate 7 allows you to open a CD track or MP3 file and transcribe it to a score with the possiblity of converting up to 16 instruments/notes playing at a time into multiple staves with up to 4 voices per staff. Immediately after transcribing your music you are able to send it directly to Sibelius or save MusicXML NIFF and MIDI files for use in most other music programs.